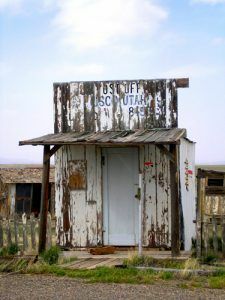 Cisco’s tiny post office is long closed, by Kathy Weiser-Alexander. Cisco – Crumbling in the Relentless Sun – Grand County railroad town, many deteriorating buildings. Clear Creek Mining Camp– Located in Carbon County, this site is occupied by a youth camp today. There are several intact houses. Coal City/Dempsey – Carbon County coal mining camp, just a few buildings. Colton – Railroad Mining Ghost Town – Carbon County, coal mining camp, no remains. Corinne – Box Elder County, railroad and mining camp, several buildings, current residents. Consumers – Carbon County, coal mining camp, foundations only. Emery – Emery County, semi-ghost, active town, farming and ranching community, numerous new and old buildings, current residents. Eureka – Utah County, mining camp, semi-ghost, numerous buildings, cemetery, current residents. Frisco – A Ten Year High – Beaver County, silver mining camp, numerous buildings and mining remains. Fruita – A Lush Valley in the Desert Terrain – Wayne County, farming community, a few buildings, active orchards, inside Capitol Reef National Park. The ghost town of Grafton near Rockville, by Kathy Weiser-Alexander. Grafton – Virgin River Ghost Town – Washington County, farming community, a few buildings, cemetery. 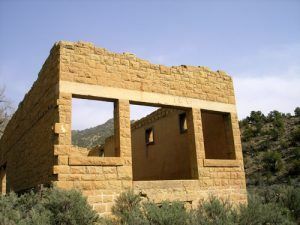 Harper – Located on the Nine Mile Canyon Scenic Byway, this was a former stagecoach stop. A few buildings remain today. Losepa – Tooele County, Mormon Historical Site, foundations, cemetery. Irontown – Juab County, State Park, charcoal kiln, foundations. Kenilworth – Carbon County, coal mining camp, numerous company houses, old company store, current residents. Latuda – Carbon County, coal mining camp, mining remnants and foundations. Mammoth – Juab County, mining camp, just a few buildings. National – Carbon County, coal mining camp, foundations. Ophir – Tooele County, mining camp, many remaining buildings, current residents. Park City – Salt Lake County, active town, mining camp, a few mining remnants, several historic buildings. Peerless – Carbon County, coal mining camp, foundations. Rains – Carbon County, coal mining camp, a few buildings and foundations. Scofield – Carbon County, coal mining camp, active community, numerous old and new buildings, current residents. American Fuel Company Store, Sego, Utah, by Kathy Weiser-Alexander. Sego Canyon – History & Ancient History – Grand County, coal mining camp, a few crumbling buildings, mining remains, cemetery. Silver City – Juab, mining camp, current mining operations, few original mining remains. 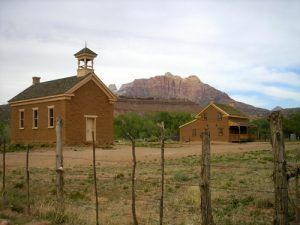 Silver Reef – Sandstone Ghost Town – Washington County, mining camp, a few old buildings, mine, foundations, current residents. Spring Canyon/Storrs – Carbon County, coal mining camp, razed in 1975, railroad remnants only. Standardville – Carbon County, coal mining camp, several buildings and foundations. Sweet – Carbon County, coal mining camp, foundations only. Thompson Springs – Dying in the Desert – Grand County, ranching and railroad town, numerous old buildings, current residents. Winter Quarters – Hidden Loot in a Ghost Town – Carbon County, coal mining camp, one building, private property, no access.